Microfluidics refers to the manipulation of fluids in microscale devices. Commonly called "labs on a chip," microfluidic systems are used to study and analyze very small-scale chemical or biological samples, replacing the extremely expensive and cumbersome instruments used for traditional biological analyses. In this interview, AZoM speaks to members of SunP Biotech about 3D bioprinting and its applications. A team led by Feng Zhao, associate professor of biomedical engineering at Michigan Technological University, recently published two new papers on best practices in engineering prevascularized tissues. Dolomite Bio has decided to transfer the µencapsulator system to their sister brand, Dolomite Microfluidics – an expert in microfluidic technology. Dolomite Bio is delighted to announce the launch of the game-changing Nadia single-cell platform, a groundbreaking system set to escalate scRNA-Seq to new heights, offering the fast-growing single-cell research sector an innovative solution for a wide range of potential applications. Dolomite Bio, part of the Blacktrace group, is helping to drive forward the single-cell genomics revolution. Emergency room doctors often have only a few minutes to determine which patients are in need of a blood transfusion. 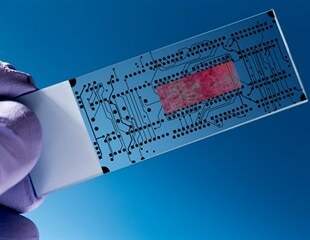 London Organ-on-Chip specialist CN Bio today announced it has secured an exclusive license to technology from the Massachusetts Institute of Technology for Organ-on-Chip systems which connect human tissues from up to 10 organs. Researchers at the University of Illinois at Chicago and Queensland University of Technology of Australia, have developed a device that can isolate individual cancer cells from patient blood samples. The microfluidic device works by separating the various cell types found in blood by their size. A new physical effect has been demonstrated at the University of Bath after 40 years of pursuit by physicists around the world, which could lead to advancements in chemical manufacturing efficiency, miniaturization and quality control in personalized pharmaceuticals. In a single sneeze or a cough, as many as 40,000 tiny droplets are forcibly propelled from our mouth and nose into the air. A collaboration of scientists including Professor Jean Patterson, Ph.D., of Texas Biomedical Research Institute, is working on a new way to detect Zika virus that will help guide clinicians in their treatment of patients with the disease. In a paper to be published in the September/December 2019 issue of TECHNOLOGY, a team of researchers from the Department of Biomedical Engineering at Illinois Institute of Technology, Chicago has developed a novel microfluidic device for measuring in real-time the cholesterol secreted from liver tissue-chip containing human hepatocytes. When people are in the early stages of an undiagnosed disease, immediate tests that lead to treatment are the best first steps. But a blood draw -- usually performed by a medical professional armed with an uncomfortably large needle -- might not be quickest, least painful or most effective method, according to new research. Droplet microfluidics has revolutionized single-cell RNA sequencing, offering a low-cost, high-throughput method for single-cell genomics. However, this method has been limited in its ability to capture complete RNA transcription information. Investigators from Brigham and Women's Hospital are developing an automated, low-cost tool to predict a woman's ovulation and aid in family planning. To treat and prevent pregnancy-related disorders, researchers must understand not only what can go wrong, but when. Complications, such as preeclampsia and pre-term birth, often occur in the second or third trimester, and most research to date has focused on those later stages of pregnancy. But the biological events that lead to these problems could start much earlier. AXT is pleased to announce that they have recently signed a distribution agreement with LUMICKS (Netherlands) that further strengthens their life science product portfolio. A new immunotherapy screening prototype developed by University of California, Irvine researchers can quickly create individualized cancer treatments that will allow physicians to effectively target tumors without the side effects of standard cancer drugs. An interview with Dr. Joseph Park, the incorporation of astrocytes into the Alzheimer’s-in-a-dish culture system and it's applications in drug development.